Fieldtype that stores a HEX color. 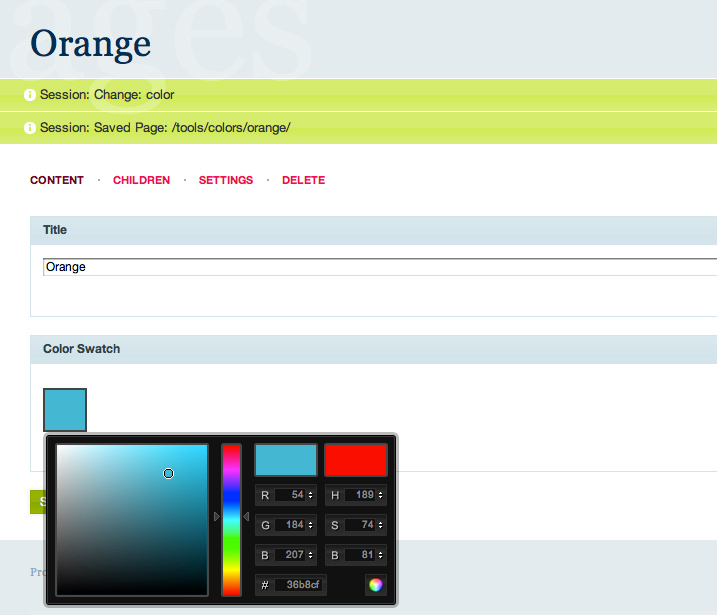 Color can be picked using a jQuery ColorPicker Plugin. When creating a new field in the admin, you can set a default value. The default value will be set when creating a new page, and it will also be used for empty fields. The field supports a transparent value. In the field setting you can use the name "transp" to define it. When output formatting (2.0.0) of the field is enabled, the field will return "transparent" in template code. The field supports a "reset" button to be able to set it back to the default value. Since of 2.0.0 you can enable output formatting of the field in the details settings. When enabled it will format value directly from AADDEE to "#AADDEE" and "transp" to "transparent". Added output formatting option to format values with prefix "#" when output in template code. Added checks for "0" values and returning them as "000000", just in case ProcessWire converts them to 0. Remove lots of code not needed. Cleanup. Login to processwire and got to Modules page and click "Check for new modules". You should see a note that two new modules were found. Install the FieldtypeColorPicker module under "Field" section. This will also install the required InputfieldColorPicker at the same time. You can now create a new field with the "ColorPicker" Fieldtype. It should be noted that the instructions for the module on this page are contradictory: the module has to be put in a folder called ColorPicker under /modules/, not "/site/modules/FieldtypeColorPicker/" as it notes earlier on this page, otherwise the module fails to find its own assets at the JS breaks the PW admin. Working with the dev 3.x ? Yes, it's working on 3.x! Version 2.0.1 not working in repeater in ProcessWire 3.0.42 MASTER. Any Fixes for this? Thx. How to choose (RGBA) Color ? ?